We’ve got great news! Have you heard we have a new skin rejuvenation treatment? Dr. Chapman of LaserMed Skin and Vein Clinic in Alpharetta, GA, is always ahead of the curve when it comes to offering the most effective treatments for skin rejuvenation. It’s Vivace™ Fractional Microneedle RF! We are so excited about this non-invasive microneedling technology with radiofrequency (RF) skin tightening and LED light therapy. The collagen-building “power couple” of microneedling and RF not only reduces fine lines, scars, stretch marks, and other blemishes, it also lifts and firms sagging skin, rejuvenating skin for a natural, more youthful appearance. After applying a topical anesthesia, sterile gold tipped microneedles painlessly puncture the skin, creating multiple microscopic channels deep into the layers of the skin that remain open up to four to six hours. This allows for better absorption of nutrient serums and healing masks that can be applied during, and after the procedure, stimulating the production of new collagen. The Vivace microneedles deliver RF energy into the deep layers of the skin with no damage to the outer layer, facilitating a natural wound healing process. This encourages renewal of your skin’s collagen, elastin and wound healing abilities, increasing your skin’s elasticity. Pulses of blue and red light activate skin cells to increase collagen production, moisture levels in skin, and improve skin tone and texture. Red light assists in renewed collagen production and improves skin tone and texture, while blue light reduces acne. Three factors unique to Vivace help it work faster than other microneedling options. First, integrated RF energy accelerates collagen production and skin tightening. Second, LED light calms inflammation and speeds healing time. Third, the gold-tipped needles create invisible “microchannels” in the skin that are extra receptive to the nutrient serums applied during treatment. These serums “feed” your skin with key nutrients to help rapidly rebuild new collagen and elastin. Here are the reasons why we love this comprehensive new treatment. Every patient’s results differ, but the biggest benefit is that the collagen you make is your own. It continues accelerated production and regeneration over a three month period, so your results actually improve over time. Your experienced beauty team of Edyta, Maureen and Dana have been performing microneedling for years, and believe Vivace has truly taken this skin rejuvenation to a new level. 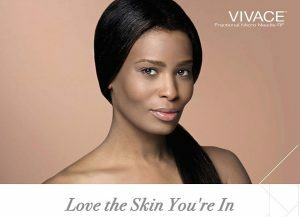 Schedule a personal evaluation and consultation with Dr. Chapman to decide if Vivace is right for you. Call 678-990-4900 to be on your way to your transformation.